I love waffling things. There’s something about the crisp edges, the fluffy (or creamy) middles, and the square indentations. 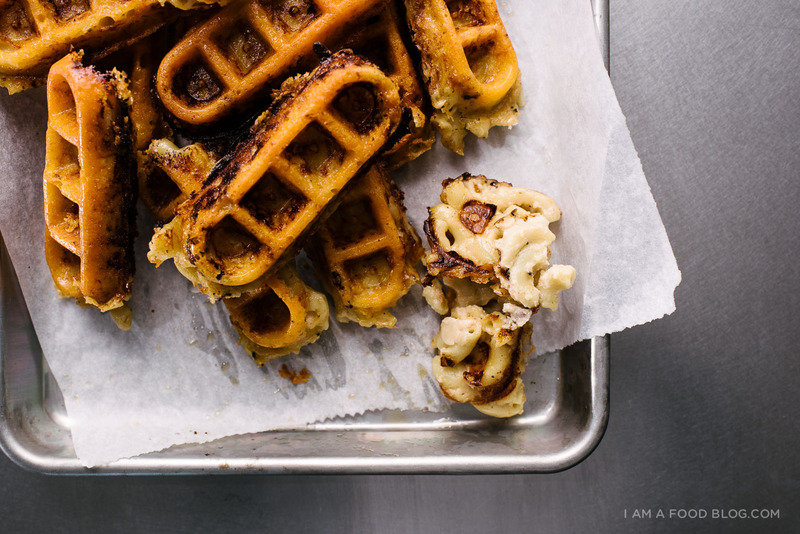 Waffles just work – especially mac and cheese waffles. They sound like a total gimmicky sort of dish, and I guess, in some ways they are, but they’re really, really good. 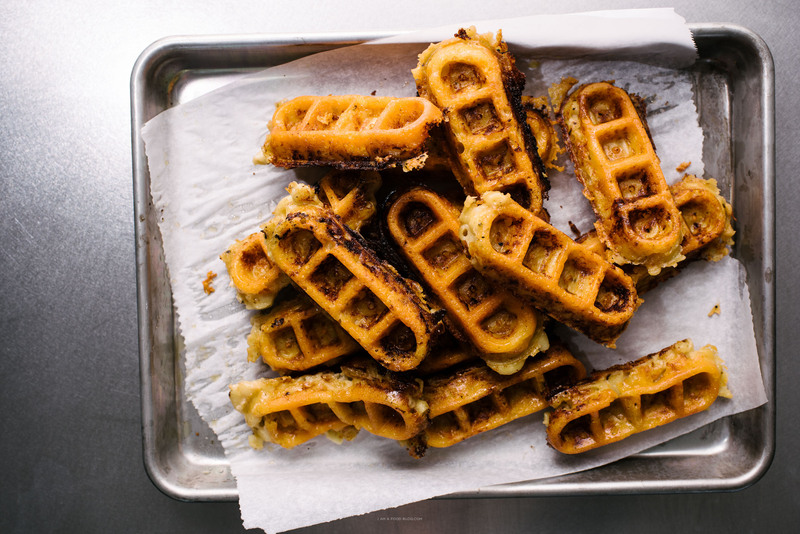 Imagine a lacy crispy cheese crust and creamy dreamy insides, all in a convenient handheld waffle shape. Perfect for dipping or having alongside another handheld type of meat like fried chicken or perhaps, ribs? Boil your macaroni until al dente, according the package. When the macaroni is finished drain, rinse with cold water and set aside until your sauce is finished. In a large sauté pan or skillet, melt the butter over medium heat. Add the flour and stir constantly for about three minutes, until completely smooth and incorporated. Pour in 1 cup of the milk in a thin stream while whisking. It might start out lumpy, but keep whisking and it will smooth out into a thick paste. Add the rest of the milk and whisk until smooth. Keep on medium heat, stirring occasionally, for about 10 minutes, until the sauce thickens. Remove from the heat and add the salt and pepper and cheese. Stir until cheese is melted. Add the drained pasta and gently mix. Taste and adjust seasonings if needed. Spread into a shallow baking sheet and let cool completely. Cover and place in the fridge overnight. The next day, the mac and cheese should be solid. Cut into shapes according to your waffle maker. I used my waffle stick maker, so I cut the mac and cheese into 1 inch x 3 inch strips – adjust accordingly. Heat up your waffle maker until hot. Sprinkle on a generous amount of shredded cheese on to the bottom of the waffle maker. 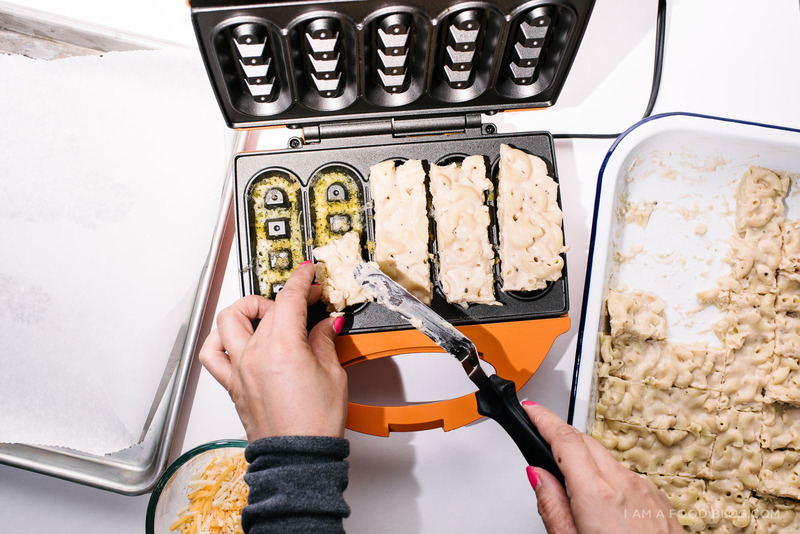 When it melts, place your mac and cheese brick into the waffle maker. Sprinkle the tops with a bit of shredded cheese and close the waffle maker gently. 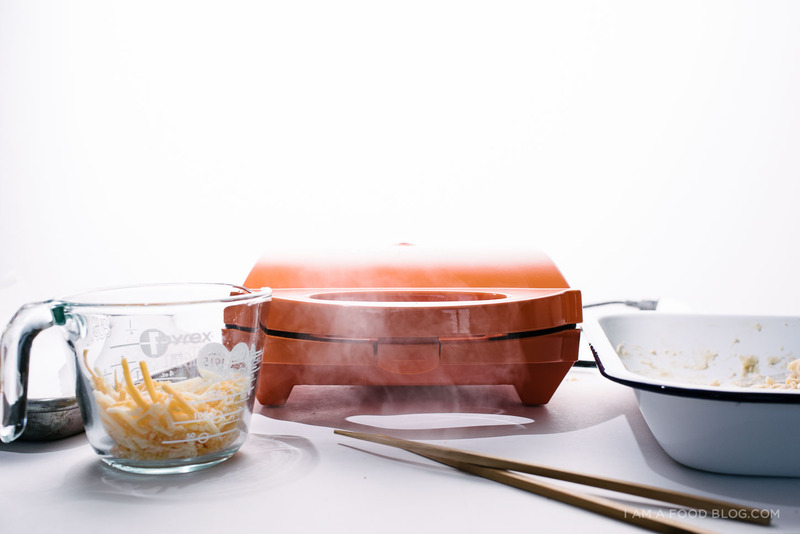 You don’t need to press down – as the mac and cheese heats up, the lid will close on its own. Cook until golden brown and crispy, about 5-6 minutes. Unplug your waffle maker and let cool slightly (this makes it easier to remove the waffles) then remove. Repeat as needed. If you let the waffles cool completely, you can prepare them the day before you want to eat. To reheat, warm in a single layer on a rimmed baking sheet in a 300°F oven for 10-15 minutes. 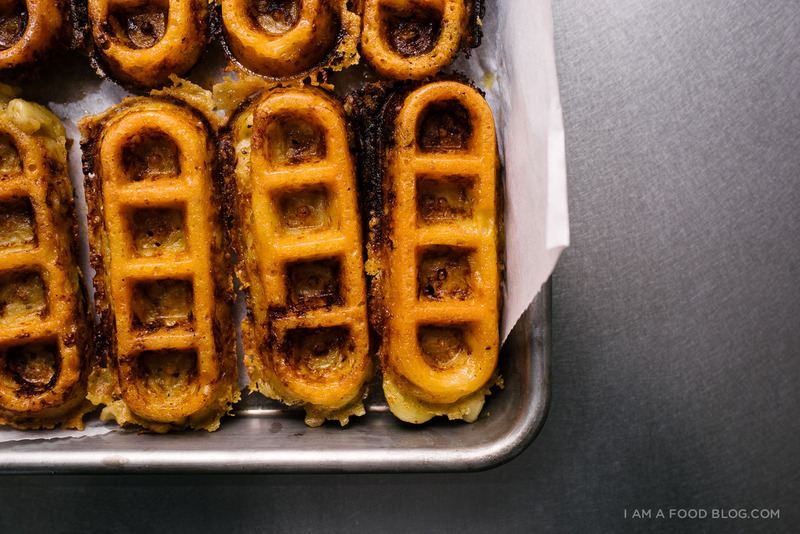 The waffles will hold their shape thanks to the crispy cheese. You can also microwave them, if you’re into microwaves. If you’re looking for the waffle stick maker, you can find it here. PS – These guys were inspired by the ever-awesome Dan of Will it Waffle fame. These guys are part of a Slow Cooked Baby Back Ribs dinner party. Check out the ribs, sangria, and chocolate cake too! UM, “lacy crispy cheese crust and creamy dreamy insides.” YES, PLEASE. Also, that waffler makes me really happy. 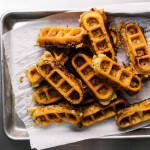 Did you have trouble unsticking the cheese from the waffle maker? Did I come off pretty easily, or did you pre grease with a lot of butter beforehand? Looks relish! i didn’t butter before hand – the cheese kind of fries into a frico crisp – like the crunchy edges of lasanga that don’t really stick to anything. you have to make sure to let it heat up long enough and also let it cool for a while before lifting the waffles out. they come out really easily after you let them cool for a bit. hope that helps! YESSSSSSSSSSSSSSS omg omg omg these are all my waffle and mac & cheese dreams come true omg. omg. steph you are my idol. This is fucked up and should be illegal (I mean that as a compliment!). Wait…you can waffle mac and cheese?! This changes EVERYTHING. Say what!!!! These are the epitome of awesomeness! OMG!!! Get In My Belly!!! My mouth is watering. I didn’t know there was such a thing as “waffling,” but I love the idea. This looks so delicious. Thanks for sharing the recipe! everything should be waffled, all the time, for ever. 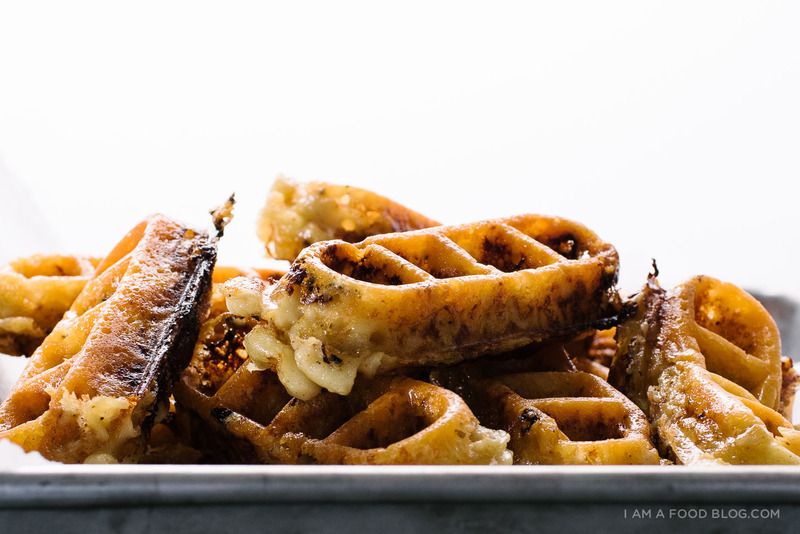 Mac and cheese waffle in one hand, whiskey sour in the other … perfect. HOW MUCH DO I HAVE TO PAY TO GET YOU TO COME MAKE THESE FOR ME AND ALANA?????? Gaa! These mac n cheese waffle sticks (fingers) are Genius!!! I need these! And I’m totally jealous of your surplus of waffle irons (machines) ! Especially, this one! Yeaaaaa… i need that too!!! Love.love.LOVE! ♡ cheers and thanks for sharing the yum!! Oh my yum!!! I too will eat anything in waffle form…also, I need this waffle maker, that dipole shape is to die for. 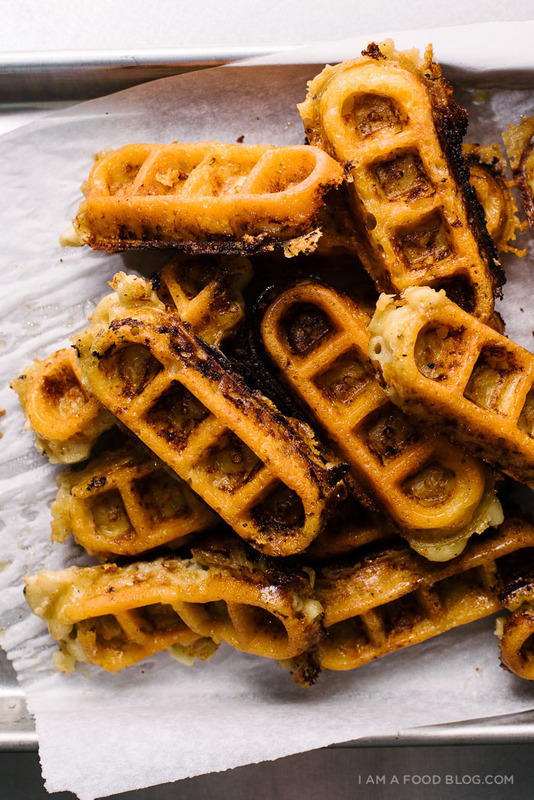 I’m trying to make these now and when I open the waffle machine all that’s there is gooey melted mac & cheese :( What did I do wrong? Thanks!! it helps when the mac and cheese is absolutely cold when you waffle it. be super generous with the shredded cheese on the outsides – it takes a while for the outer cheese to melt and set up – it needs to get the moisture out before it. if you have temperature settings on your waffle maker, make sure they’re turned to medium and let the waffle stay in for as long as it needs for a cheese crust (like the kind you get when you bake lasagna) to form, let it cool then remove it. i hope this helps! Can’t wait to try these! Yummy!